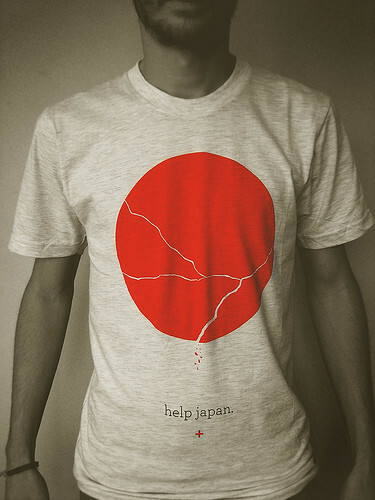 Found this photo of the Help Japan t-shirt on flickr. The t-shirt is from Respire Apparel and 100% of the profit will go to the Japan Earthquake / Tsunami Relief Fund over @ GlobalGiving. Rosa Loves is not your usual t-shirt company. Their objective is to help individuals in need by telling their stories in a t-shirt and selling it. A percentage (I don't know what the numbers are) of the money raised goes back to those individuals. Their motto is "Designed for good" and each t-shirt on sale tells a different story through a graphic design and a text that appears on the inverse of the shirt. Their latest t-shirt is called "The Sharkar Family" and was inspired by the life of hardship of a Bangladeshi family. "We hope to encourage individual people to get involved in the community around them on a somewhat tangible scale. We will accomplish this by providing financial support to those in need by infiltrating the t-shirt industry with a new perspective of how clothing can serve a purpose other than outfitting. Everyone has a story. Everyone has a need. By using art and creativity, we hope to foster hope and encouragement through the aid of apparel."